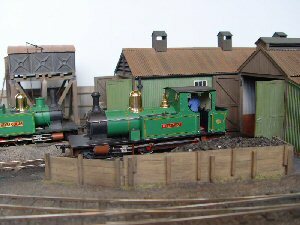 The pictures below are examples of layouts created by our members, and our Show Diary gives information on where and when you can see some of these layouts. This web site offers a guide to our hobby and the services we offer to our members. 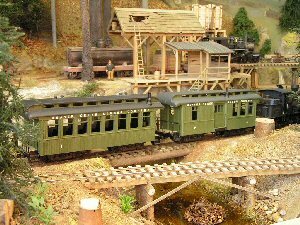 If you are new to narrow gauge modelling, or are unsure of where to start and perhaps confused by the wealth of alternative scales and gauges, then read our page on "What Is Narrow Gauge ". Visitors are welcome to browse the public pages of our website. Many of our members model just for the fun, and you do not have to be an expert to enjoy the hobby. 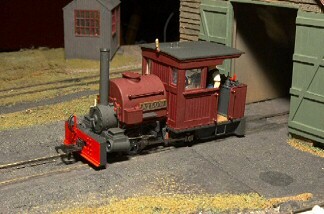 In narrow gauge, the layouts may be quite compact, yet still produce a realistic model. This scale gives a useful size of model for narrow gauge modelling without requiring too much space. The models are large enough to be modelled using human sized fingers and with normal eyesight! Models, particularly rolling stock such a engines and coaches, are sturdy and have a reasonable weight, which gives good adhesion and electrical contact. Additionally, 7mm scale being that of O gauge also gives access to commercially produced figures and many other accessories. Many members use 16.5mm gauge track as a standard, which has the advantage of commercial support for track and a wide range of HO/OO locomotive chassis, suitable for the larger scale in narrow gauge. 16.5mm is equivalent to 2'4", a prototype gauge representative of the Talyllyn, Corris, Glyn Valley and Welshpool & Llanfair, and is also acceptable for many to represent other railways. However, those who require greater accuracy scratch build their track at 14mm for 2' gauge and a few at 21mm for 3' gauge. A growing interest is modelling the 15" gauge or similar, on 9mm track using N gauge components, whilst a few choose to use 6.5mm Z gauge track, which scales to about 10.5" gauge. 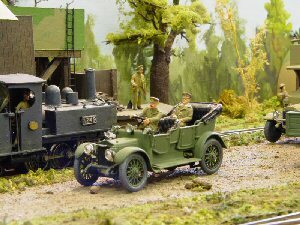 We also have a few members who are using 9mm scale, (1:33.8) or 8mm scale, (1:38) to considerable effect and, as their work is seen, others are being converted. Not everything need be scratch built. There are now a large number of manufacturers who support our scale with kits and accessories, whilst Bachmann produce ready to run American (On30) rolling stock. Because of the availability of ready-to-run stock, the US On30 (1/4 inch to the foot scale on 16.5mm track) has become very popular, with some fine layouts on the exhibition circuit. The Association was founded in 1979 and is based in the UK. We also have some members all round the world, in most European countries, while the USA, Canada, South America, Japan, Australia, New Zealand, Hong Kong, Scandinavia, India and South Africa are also represented. We have a number of Area Groups which meet regularly for members to swap information and tips, or in some case, to collaborate in the building of layouts. We also have a very active Sales Department to cater for members' specialised needs. Details of the principal benefits of joining the Association may be found on this page. A copy of our booklet "Introduction to 7mm Narrow Gauge Modelling" may be downloaded here. Click here see more of the layouts, locos, stock and buildings produced by some of our members.